"The Red Sea Pedestrians are nothing but pure talent and poise. The music they play keeps you at a steady hold and then envelopes you into joy and community"
"The Red Sea Pedestrians are purveyors of modern world music via Michigan. With imaginative originals, carefully chosen covers, creative, inventive arrangements across the board and a delightful rapport with the crowd, the Red Sea Pedestrians are a rare band that can please an audience of all ages and all walks of life. Clearly they love what they're doing. I sure do!" "People danced like drunken gypsies as soon as the band took the stage. Everybody was really into the whole experience, the atmosphere that was created by the band's music, the sheer sense of fun in the air." "The Kalamazoo ensemble combines a potpourri of instruments with hypnotic vocals to create something at-once unique, delectably listenable and randomly humorous." "RSP conjure up a sound the likes of which I've never heard in concert. Part Decemberists, part "Fiddler on the Roof," the band infused the festival with a blend of Klezmer, Greek, Gypsy, Celtic, jazz and American roots. [The band] stood out not only because of their instrumental and vocal talents, but also because most, if not all, of their songs are originals. The performance was truly entrancing." The Red Sea Pedestrians are a one-of-a-kind, full-blown, instrument-swapping fusion between tradition and the here-and-now. We’re talkin’ high-energy world-beat grooves, hypnotic laments from the earth, songs of celebration and wonder, all filtered through the band’s original vision. RSP is a melting pot of five distinct singer/songwriters and multi-instrumentalists, exploring a warped and beautiful blend of Klezmer, Gypsy, Jazz and American Roots music. The Red Sea Pedestrians are a one-of-a-kind, full-blown, instrument-swapping fusion between tradition and the here-and-now. We’re talkin’ high-energy world-beat grooves, hypnotic laments from the earth, songs of celebration and wonder: a warped and beautiful blend of Klezmer, Gypsy, Jazz and American Roots, all filtered through the band’s original vision. RSP are a melting pot of five distinct singer/songwriters, almost a self-contained variety show. Their sound is first defined by the sweet interplay between clarinet and violin, and is colored by three singers and multi-instrumentalists, as well as skilled percussion that provides the backbone to a musical experience that is both harmonically and rhythmically gratifying. The band members are also students of the great records of the sixties (notably late Beatles), and hence they have created a realm that is both comforting and challenging to the listener. Multi-layered lyrics, rich harmonies, and masterful playing complete the story. Their captivating live shows and ambitious CDs have been getting rave reviews and building an energetic buzz throughout Michigan's independent acoustic music community, including back-to-back WYCE Jammie Awards for Best Roots Album for "Adrift" (2010) and "The Electromagnetic Escape" (2011). The Red Sea Pedestrians have performed at Michigan-area venues and festivals including The Ark (Ann Arbor),Wheatland Music Festival (Remus), The Michigan Theater (Ann Arbor), Blissfest Music Festival (Cross Village), the Earthwork Harvest Gathering (Lake City), The Porcupine Mountains Music Festival (Ontonagon), Coopers Glen Music Festival (Kalamazoo), Nor East’r Music Festival (Mio), Bell’s Brewery (Kalamazoo), Founder’s Brewery (Grand Rapids), LVD’s Concert Hall (Goshen, IN), and both the 2008 and 2010 WYCE Jammie Awards (Grand Rapids). 2016 - See Through The Eyes Of Osiris! 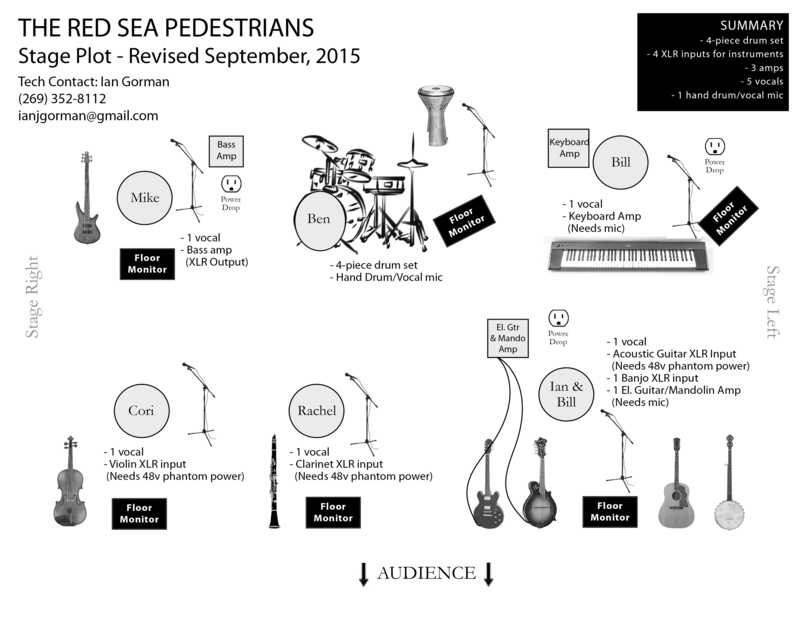 Click on the image below to download RSP's current stage plot. Please contact Ian Gorman at redseapedestrians@gmail.com for any additional tech questions.